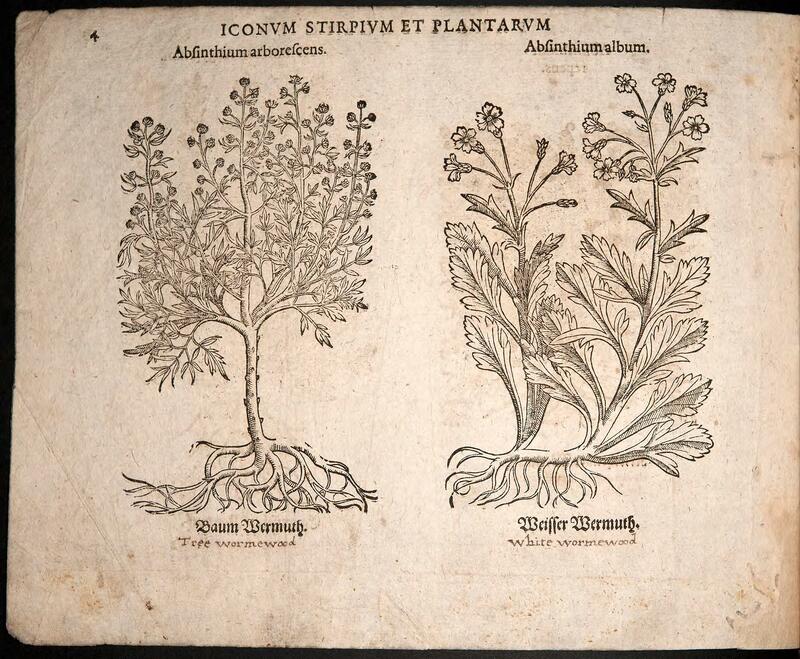 Eicones plantarum… (1590) by Iacobus Theodorus, in the collection of the Lenhardt Library of the Chicago Botanic Garden. Image credit: Leora Siegel. A look inside Eicones plantarum… (1590) by Iacobus Theodorus, in the collection of the Lenhardt Library of the Chicago Botanic Garden. Image credit: Leora Siegel. 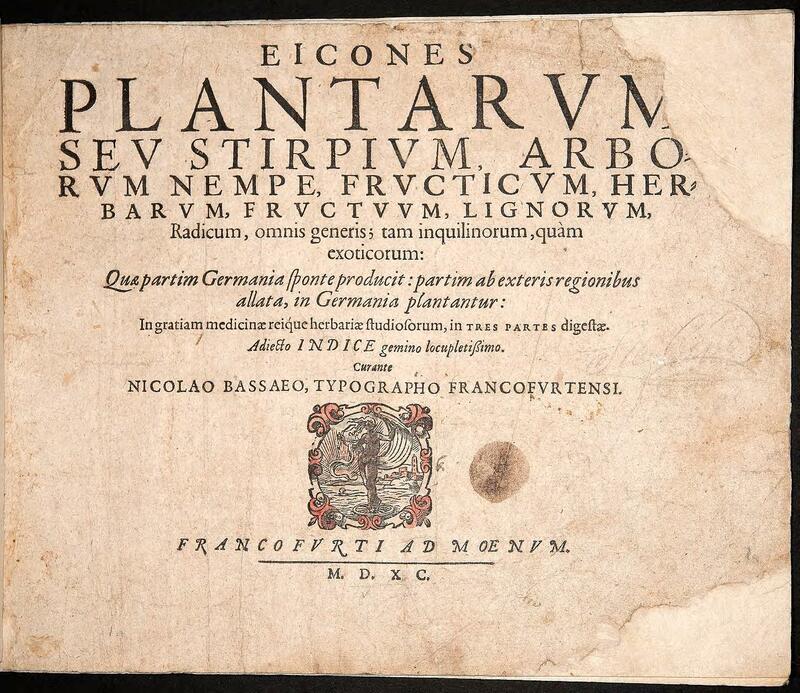 Title page from Eicones plantarum… (1590) by Iacobus Theodorus. 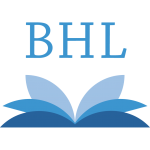 Contributed in BHL from the Lenhardt Library of the Chicago Botanic Garden. Jacobus Theodorus (modern form of Iacobus), born in 1522 or 1525, was a German herbalist and physician. He is known by the name “Tabernaemontanus”, which comes from the Latin version of his hometown in Germany, Berg-Zabern or Tabernae Montanae. Jacobus Theodorus Tabernaemontanus. Line engraving, 1688. Credit: Wellcome Library, London. Wellcome Images. Tabernaemontanus trained as an apothecary at first, and then changed careers and became a physician, focused on medicinal herbs as remedies. He studied under the great herbalists of his time, including Otto Brunfels and Hieronymus Bock. His seminal work, Neuw Kreuterbuch…, published in 1588, contained over 2,300 botanical woodcut illustrations with descriptions of the plants and their uses. He wrote this work to expand upon his herbalist predecessors and to enhance the knowledge of the time period. In all, he spent 36 years working on the project. 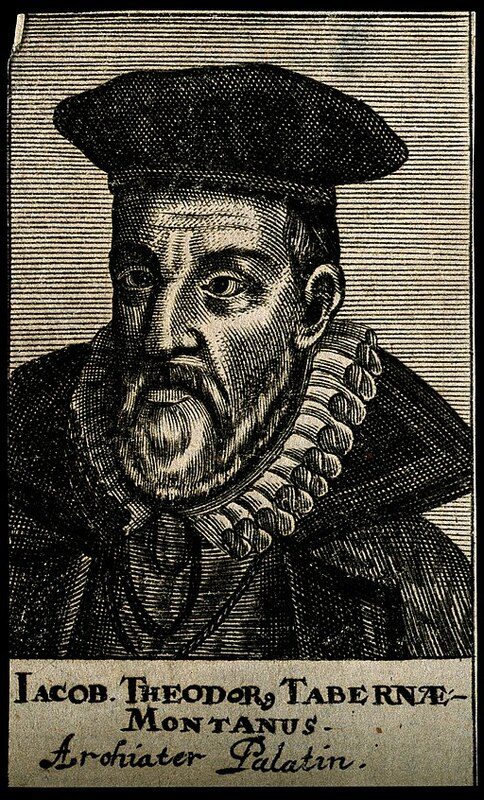 Considered one of the fathers of German botany, he died in 1590, the same year Eicones plantarum was published. Tabernaemontana densiflora (a synonym of Rauvolfia verticillata) was named for Tabernaemontanus. 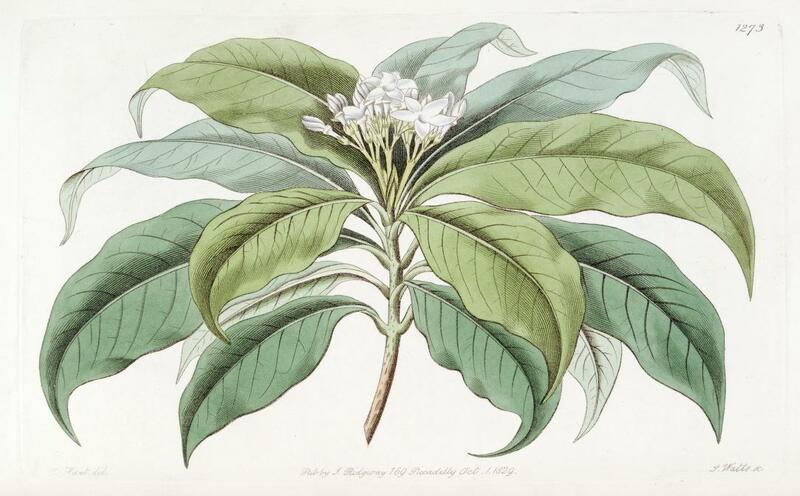 In describing the flower in Edward’s Botanical Register, volume 15, 1829, John Lindley stated that “Tabernaemontanus was a botanist of the 16th century, whose works have long sunk into oblivion.” Illustration of T. densiflora by M. Hart from Edward’s Botanical Register, v. 15 (1829), contributed in BHL from the Peter H. Raven Library of the Missouri Botanical Garden. 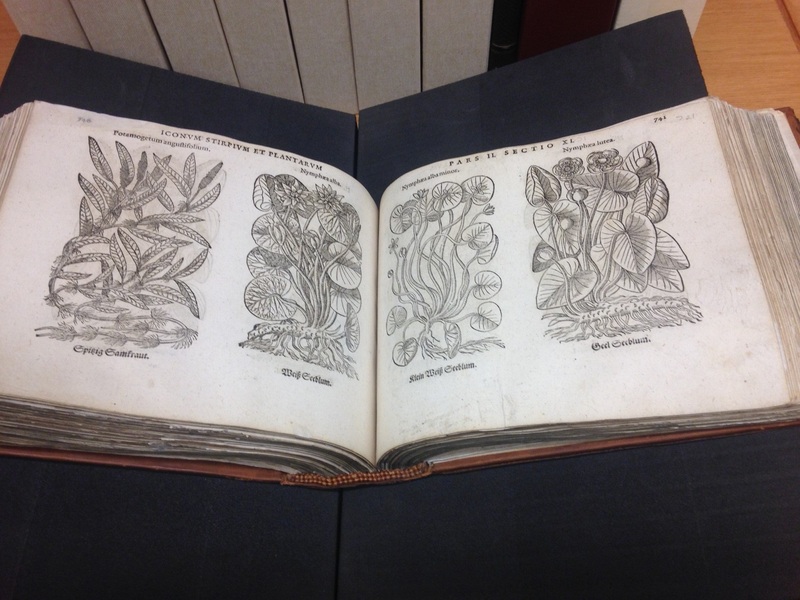 Our book, Eicones plantarum…, is an edition of only the botanical woodcuts from Neuw Kreuterbuch. Although it does not have the text, it does includes the names of the plants in Latin and German. 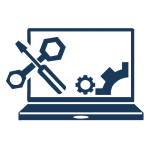 With its content and shape, it must have been published in this way to serve a different purpose that the more typical folios of the time that were larger and comprehensive. As its title indicates, it may have been used as a quick reference guide for botanists, physicians, herbalists, and students to easily flip through to identify unknown plants and their names, in this Pre-Linnean era. 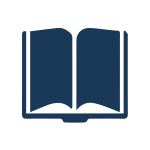 As highlighted in General Biography; or, Lives, Critical and Historical, of the Most Eminent Persons of all ages, countries, conditions, and professions… by John Aikin and William Johnston (v. 9, 1814, pg. 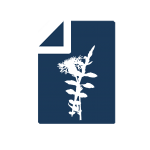 310), as a physician, the herb Tabernaemontanus often prescribed as a remedy was mugwort. Mugwort (or wormwood) from Eicones plantarum… (1590), contributed in BHL from the Lenhardt Library of the Chicago Botanic Garden. For those familiar with John Gerard’s The Herball (1597), the woodcuts may look familiar. The well- known English language Renaissance botanical work re-used many of the woodcuts from the books by Tabernaemontanus. 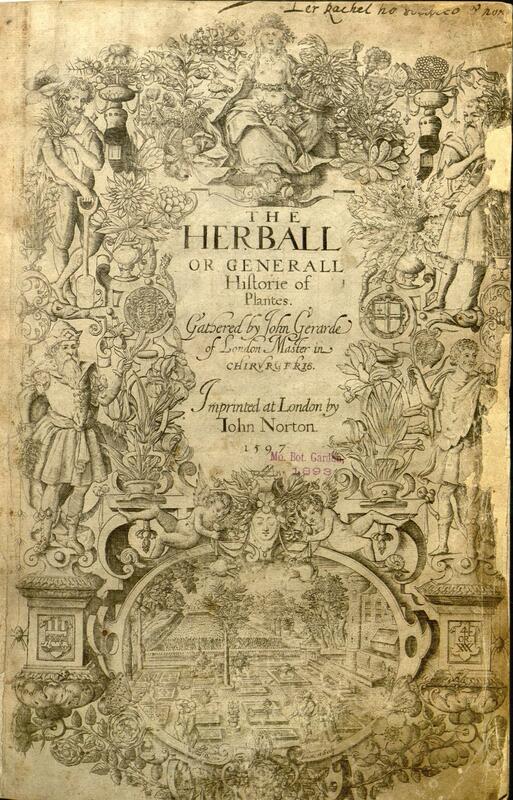 John Norton, publisher of The Herball, acquired them from Nicolas Bassaeus, publisher of Eicones plantarum. Title page from John Gerard’s The Herball (1597), contributed in BHL from the Peter H. Raven Library of the Missouri Botanical Garden. 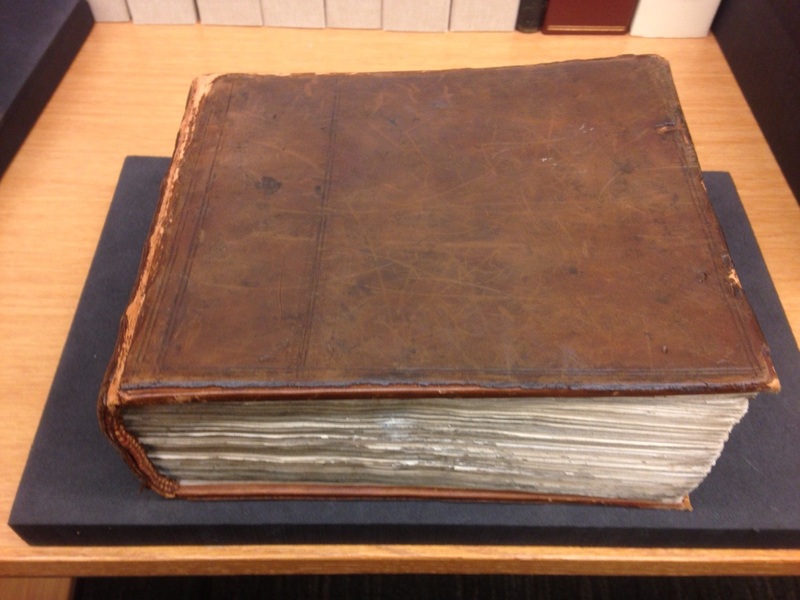 Digitizing this 428-year-old volume was a labor of love for us in the 21st century. The book was imaged by a team of volunteers over a three-year period. Metadata for each woodcut (including transcriptions of German and Latin names, soon to uploaded to BHL) was assigned by Mary Roback. Mary came to the Lenhardt Library as a Library Science graduate student and stayed on as a volunteer after graduation. She took on the metadata project to keep involved with special collections while undergoing chemotherapy. While she has sadly passed away, her valuable contributions to this project have left a lasting legacy, ensuring that this volume is accessible to readers around the world today and into the future. We are truly grateful for her dedication to this project and are honored to have shared this experience with her. Aikin, John, William Enfield, Nicholson, Thomas Morgan, and William Johnston. General Biography; Or, Lives, Critical and Historical, of the Most Eminent Persons of All Ages, Countries, Conditions, and Professions, Arranged According to Alphabetical Order. London: Printed for G.G. and J. Robinson, 1799. Arber, Agnes. Herbals: their origin and evolution, a chapter in the history of botany, 1470-1670. 2nd edition. Cambridge: University Press, 1953. Edwards, Sydenham, and John Lindley. 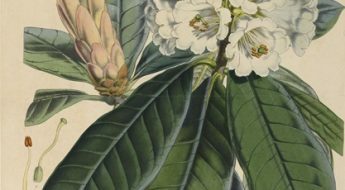 Edwards’s Botanical Register, or, Ornamental Flower-Garden and Shrubbery. London: James Ridgway, 1829. 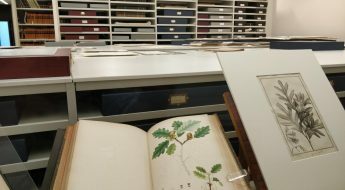 Johnston, Stanley H. The Cleveland Herbal, Botanical, and Horticultural Collections: A Descriptive Bibliography of Pre-1830 Works from the Libraries of the Holden Arboretum, the Cleveland Medical Library Association, and the Garden Center of Greater Cleveland. Kent, Ohio: Kent State University Press, 1992. 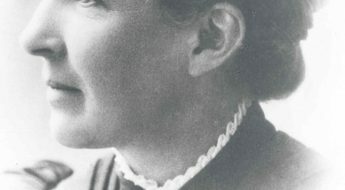 Rohde, Eleanour Sinclair. The Old English Herbals with coloured frontispiece and 17 illustrations. London: Longmans & Co., 1922. Stearn, William T. Stearn’s Dictionary of Plant Names for Gardeners: A Handbook on the Origin and Meaning of the Botanical Names of Some Cultivated Plants. Portland, OR: Timber Press, 2002.